More Protests In Muslim Nations; Some Violence And Deaths : The Two-Way Tens of thousands of anti-American protesters have taken to the streets again. In Pakistan. There are reports of at least six deaths. 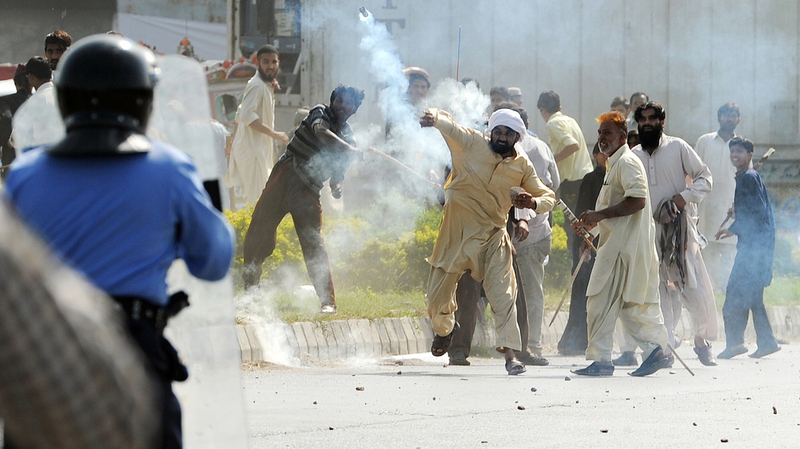 In Islamabad today, this demonstrator threw a tear gas canister back toward police. Tens of thousands of people are protesting in all of Pakistan's major cities today, NPR's Jackie Northam reports from Islamabad, as those who oppose U.S. policy in the region continue to use outrage over an anti-Islam video to whip up anti-American sentiment. There are also reports of new protests in other Muslim nations, including Bangladesh and Malaysia. On Morning Edition, Jackie told host Steve Inskeep that police have fired tear gas in many cities — and live ammunition at a bridge from the city of Rawalpindi into Islamabad. Protesters have been trying to reach American consulates in cities such as Peshawar and Karachi, Jackie reports. There are scenes of burning tires and clashes with police. The Guardian, which is live blogging, adds that "an employee from Pakistan's Ary News has been killed," according to local news reports. Pakistani authorities declared this to be "love the prophet day" — which effectively encouraged the demonstrations. The video that organizers have used to bring protesters into the streets of many Muslim nations, of course, is an anti-Islam production called Innocence of Muslims that was made by an Egyptian-born Coptic Christian who lives in California. The U.S. ambassador to Libya, Chris Stevens, was among four Americans who died last week after the consulate in Benghazi was attacked. Pakistan's leading TV station is reporting "as many as 19 people were killed" during today's protests, says The New York Times. Pakistan's Dawn newspaper says there have been at least 13 deaths and nearly 200 people have been wounded. "In France, where the publication of cartoons denigrating the Prophet stoked anger over an anti-Islam video made in California, the authorities banned all protests over the issue. 'There will be strictly no exceptions. Demonstrations will be banned and broken up,' said Interior Minister Manuel Valls."